My best weddings have been those where I've built a relationship with my couple. That's when we are able to let our hair down, laugh, cry, and let loose. And to me, in those moments, that's where the magic is. That quote right there, exactly. I want our energy to be right. I want you to feel seen, heard and valued. We will be working together on your wedding day, and I want you to feel supported completely through the process. I've found that I connect best with couples who truly believe their wedding photos are important. I truly believe this too with every ounce of my heart. Your wedding photos will be the only thing that will live on after your wedding day for you to look back on, and that is so incredibly special. If you are looking for the cheapest price, we may not be the best fit because you may not find the value in what I want to give you. I want to give you photos that can last forever, that you can show your children someday, and that you are proud to hang on your walls. These photos will be the only thing that you have to look back on after your wedding day is over, and I want them to be freaking amazing. 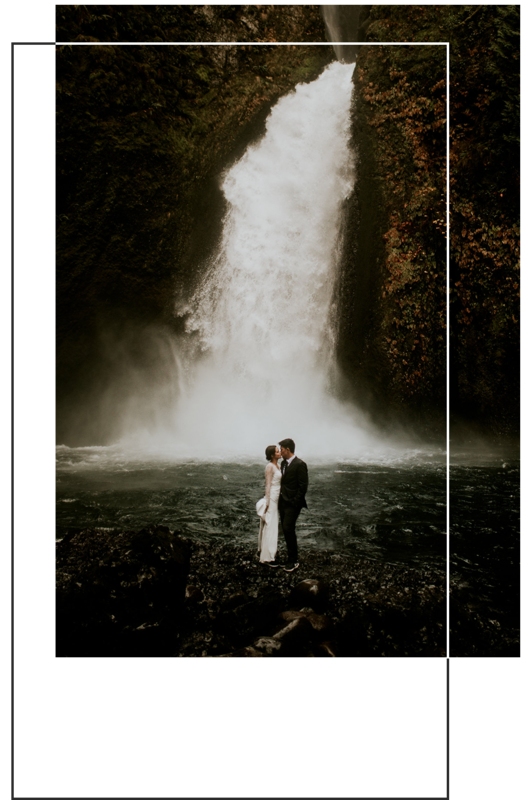 My favorite moments with couples have been hiking to waterfalls despite a little PNW rain, finding a cave that made the perfect bridal suite, popping champagne on the top of mountains as we watched the sun fall behind distant peaks. Don’t get me wrong- not every wedding is an adventure, and while I love a good outdoor setting- what I love even more are two genuine, kindhearted, crazy in love humans. I have just as many favorite moments from listing to sweet, sweet vows exchanged leaving not a dry eye in the audience, a crazy dance party under some string lights, a father daughter first look where he completely loses and tears of love just stream down his face, first dances surrounded by sparklers, anything involving a furhuman dressed in a bowtie, late night snack pizza deliveries. The experiences are all unique and different, but all have one common thread to them. They all include a couple that is madly in love with each other, not afraid to dream a little differently, let their hair blow in the wind, and can fully embrace all of in between, unposed moments that can be equally messy and beautiful all at the same time. If this sounds like you, then YES. LETS DO THE DANG THING. Fill out this contact form and let me hear it. I want the details, I LOVE hearing about the two of you right out of the gate because that is what get me EXCITED about YOU. The details, the story, the little things that make you guys YOU, LET'S GO! What's your story? Tell me about the two of you! How'd you meet and how has this all gone down?! This is the kind of stuff that makes me EXCITED. What can I find you two doing on a sunny weekend afternoon? Do you have any pets? Drink of choice? Got some questions, go ahead and ask em' here!